Go to original pattern for design DROPS 180-12. 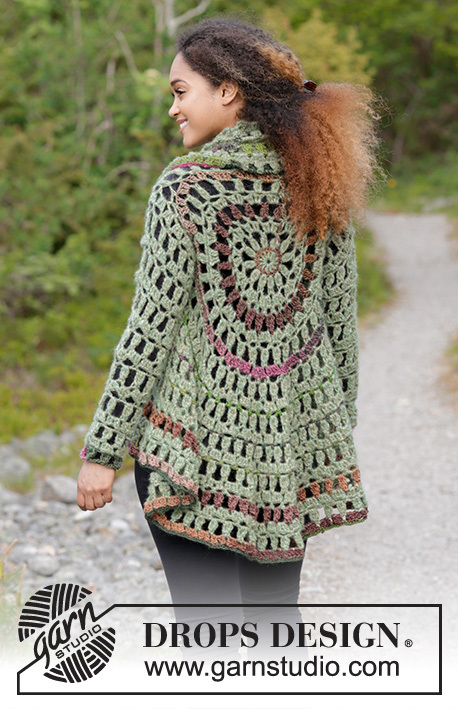 Crochet circle jacket with stripes. Sizes S - XXXL. The piece is worked in DROPS Air and DROPS Big Delight. 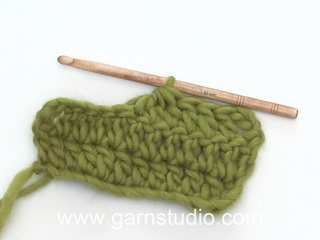 DROPS CROCHET HOOK SIZE 6 MM / J/10 – or the size needed to get 12 double crochets and 7 rows on 10 cm / 4'' in width and 10 cm / 4'' in height. 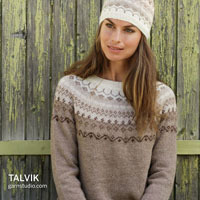 You can get the yarn to make this pattern from	47.40$. Read more. See diagrams A.1 to A.6. 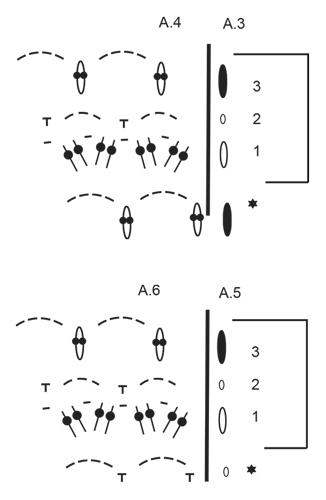 Diagrams A.1, A.3 and A.5 show how the rounds start and finish, diagrams A.2, A.4 and A.6 are repeated on the round. Work as for rounds 3-6, two more times. Work as for rounds 21-24 to finished length. 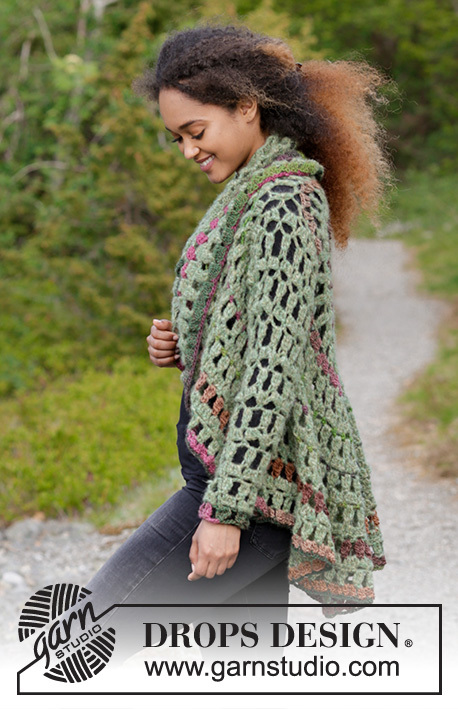 The stitches in A.1, A.3 and A.5 are always crocheted with one strand of each quality, so that the strand you are not using will follow your work upwards until you need to use it. 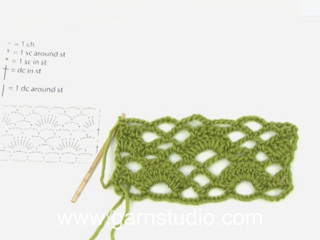 Increase 1 chain-space by working 3 chain stitches + 1 single crochet around the chain stitch in the middle of the double crochet group from the previous round. Decrease 1 chain-space by skipping 2 chain stitches instead of 1 chain stitch 2 times evenly spaced on the round = 1 chain-space decreased. The jacket will be quite stretchy. It is advisable to try the jacket on before the sleeves are finished, to get the right length. The piece is worked in the round from mid back. READ THE WHOLE PATTERN BEFORE STARTING! 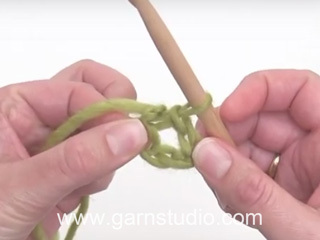 Work 4 chain stitches with hook size 6 mm / J/10 and Air and form them to a ring with 1 slip stitch in the first chain stitch. READ COLORS and COLOR CHANGE! Work A.1, then work A.2 a total of 4 times on the round. REMEMBER THE CROCHET GAUGE! Work A.1 and A.2 1 time in height = 32 double crochet groups/chain-spaces (the stitches in A.1 are not counted in the total number of stitches). Work round 1. in A.3 and A.4, then work round 2 in A.3 and A.4, AT THE SAME TIME as you increase 16 chain-spaces evenly on round – READ INCREASE TIP = 48 chain-spaces. Continue by working armholes – see description below. Work A.3 and A.4 1 time in height, AT THE SAME TIME on round 2 in A.4 increase 16 chain spaces evenly on round = 48 double crochet groups/chain-spaces. Continue with round 1 in A.3 and A.4, then work round 2 in A.3 and A.4, AT THE SAME TIME as you increase 16 chain-spaces evenly on round = 64 chain-spaces. Continue by working armholes – see description below. 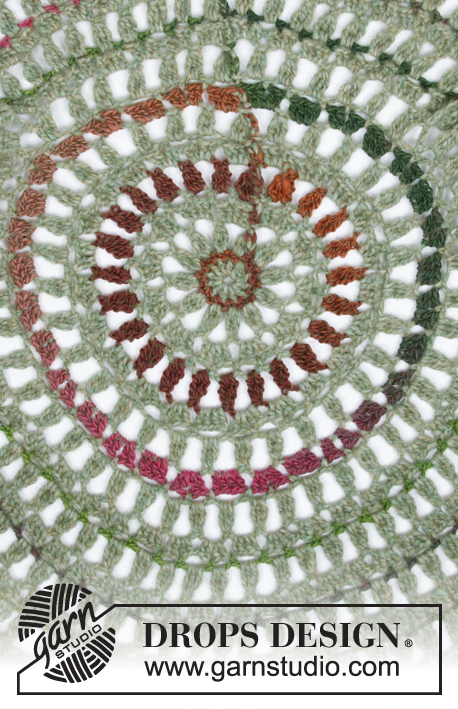 Work A.3 and A.4 2 times in height, increase 16 chain-spaces evenly on round every time you work round 2 in A.4 = 64 double crochet groups/chain-spaces. Continue by working round 1 in A.3 and A.4, then work round 2 in A.3 and A.4, AT THE SAME TIME as you increase 12 chain spaces evenly on round = 76 chain-spaces. 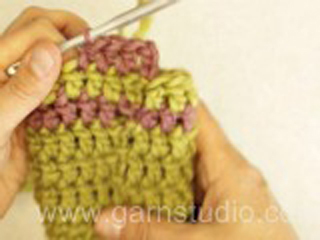 Continue by working armholes – see description below. Now work the last round in A.4 and work the armhole as follows: Work 3 treble crochets together + 4 chain stitches in each of the first 6-7-8 chain-spaces, work 3 treble crochets together in the next chain-space, work 22-26-30 chain stitches and skip 5-6-7 chain-spaces, work 3 treble crochets together + 4 chain stitches in each of the next 23-35-43 chain-spaces, work 3 treble crochets together in the next chain-space, work 22-26-30 chain stitches and skip 5-6-7 chain-spaces, work 3 treble crochets together + 4 chain stitches in each of the last 7-8-9 chain-spaces. 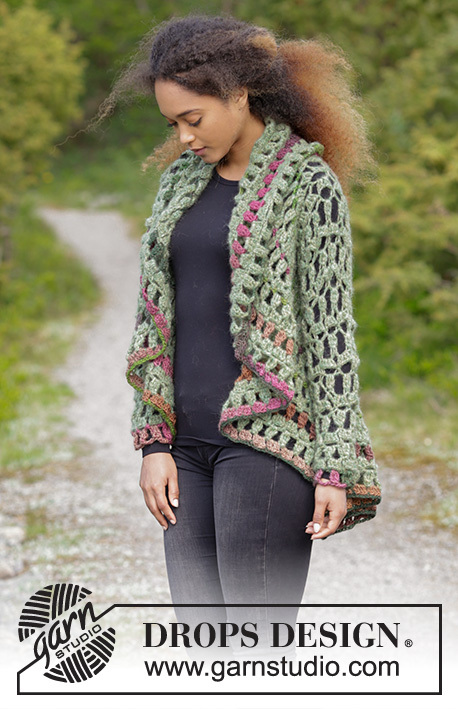 Continue with the first round in A.3 and A.4, around the chain-spaces for the armhole, work 6-7-8 double crochet groups = 48-64-76 double crochet groups. Continue with A.3 and A.4, repeat the 3 rounds in height and increase 12 chain-spaces evenly on the round every time you work round 2 in A.4. NOTE! In size S/M increase 16 chain-spaces the first time, then increase 12 chain-spaces. Continue until the piece measures approx. 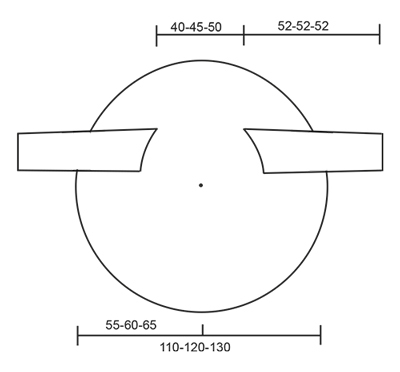 110-120-130 cm / 43½"-47 1/4"-51½" in diameter– READ MEASUREMENT TIP! Cut and fasten the strand. The sleeve is worked with Air. Start in the bottom corner of the armhole, work 1 single crochet, * 4 chain stitches, 1 single crochet around the next chain-space *, repeat from *-* as far as the other corner of the armhole = 6-7-8 chain-spaces, work 6-7-8 chain-spaces on the other side of the armhole in the same way = 12-14-16 chain-spaces. Continue with A.5 and A.6 and decrease 1 chain-space on round 2 – READ DECREASE TIP! = 11-13-15 chain-spaces. Repeat the 3 rounds in height. Continue to decrease every time round 2 is worked until there are 7-8-9 chain-spaces left on the round. When the sleeve measures 50 cm / 19 3/4'' in all sizes – REMEMBER MEASUREMENT TIP, work 2 rounds with Big Delight, cut and fasten the strand. Work the other sleeve in the same way. 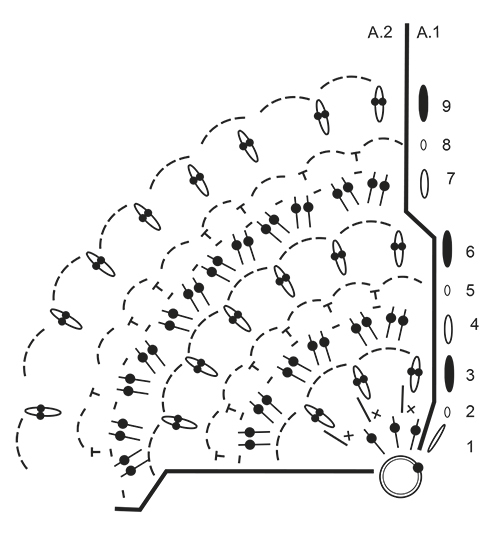 = The round starts with 2 chain stitches and finishes with 1 slip stitch in the 2nd chain stitch at the beginning of the round, work slip stitches to the middle of the next chain-space (at the end of round 2 in A.1, finish only with 1 slip stitch in the 2nd chain stitch at the beginning of the round).